Typical configuration examples of where Gall Thomson UBCs might be employed. 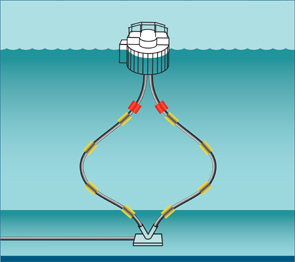 Single Point Mooring underbuoy Marine Breakaway Coupling positions within hose strings are shown in orange. Float position examples are shown in yellow. SPM with underbuoy hoses in a Chinese Lantern configuration. 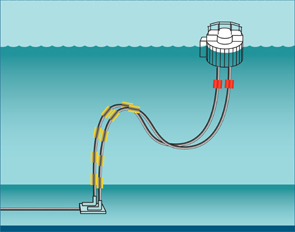 SPM with underbuoy hoses in a Lazy ‘S’ configuration. 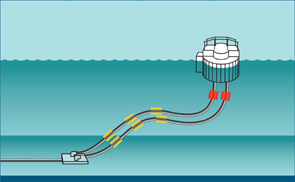 SPM with underbuoy hoses in a Lazy ‘S’ shallow water configuration. 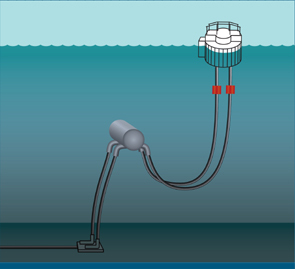 SPM with underbuoy hoses in a Lazy ‘S’ deep water configuration.